Publisher: Japanime Games. Designer: gingko. Year Published: 2011. POST BY CATHY BOCK. 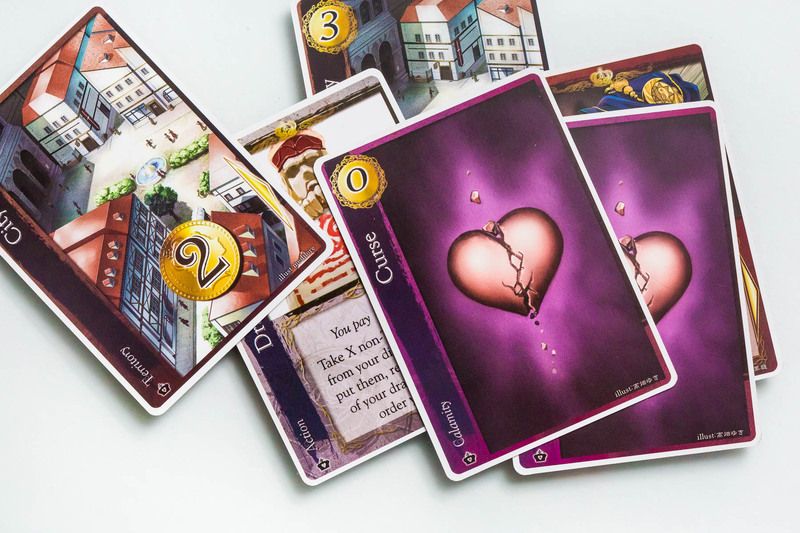 Many of us still remember that first game of Dominion, sitting across from that over-excited friend–the one obsessed with board games of all things–who seemed sure they were about to change your life with something revolutionary. And maybe they were right. Because you played it, this dull-looking card game, and you actually liked it. At first it seemed so simple–play some cards, buy some cards, play some cards, buy some cards, shuffle and repeat. But then the game suddenly ended just as you were getting going. Just as it was getting good. You’d discovered these combinations of cards that gave you more cards and then more money to buy more cards and you were feeling so so smart about it all. But then it was over. While you were busy being smart, your friend, now sitting there with that smug grin, had whittled away that pile of Provinces, leaving you with a worthless brick of cards in front of you. There had been a subtle shift in the game that you had missed. And it was clever. Different. Even fun. 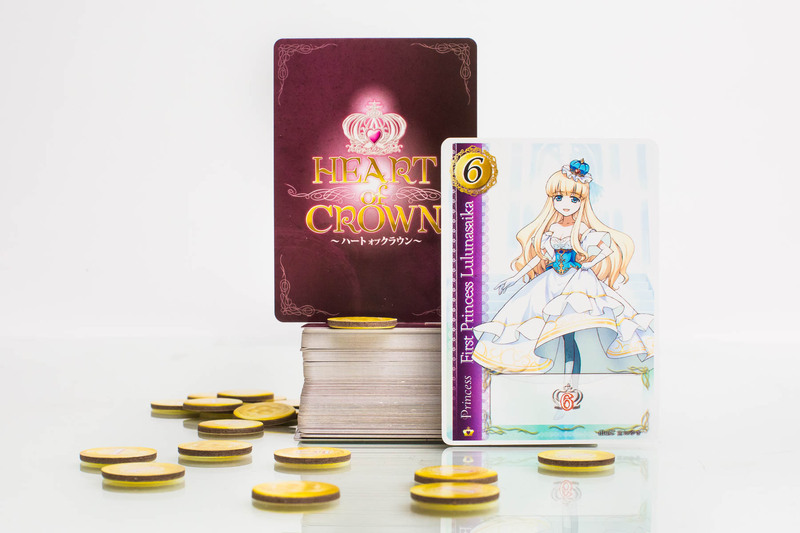 It would be impossible for me to talk about Heart of Crown without talking about Dominion. Dominion spawned a whole genre of deck-builders and was a gateway game for many of us. But it was mostly devoid of theme, and what little theme it had was not appealing. 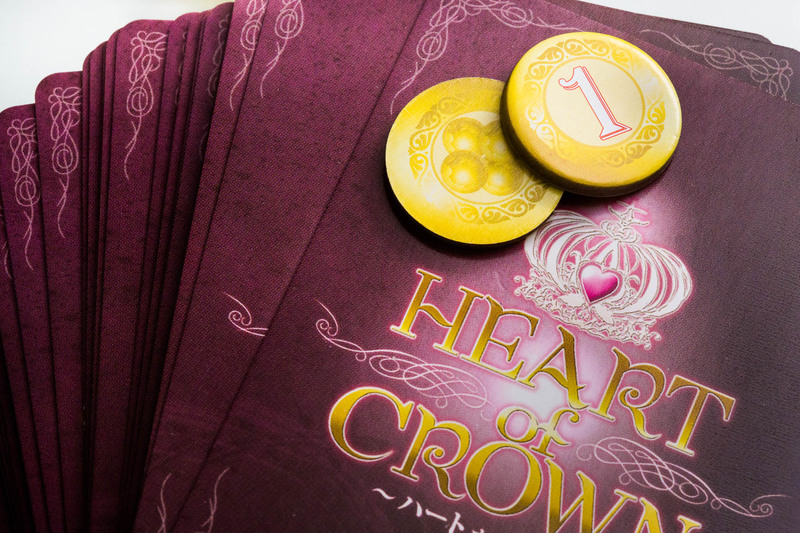 Enter Heart of Crown. Heart of Crown is Dominion in lace. Dominion with blue-haired anime princesses, maids in aprons, and magical girl witches. And while the anime theme is not really my thing, it gives the game a heart and a feeling that I’m doing something for a purpose, something I never felt with Dominion. Also, *whispers* it’s just a better game. In Heart of Crown, your emperor has died unexpectedly, leaving an open throne and seven daughters. You must decide which princess to give your support and then earn enough succession points to ensure her place on the throne. The setup is what you’d expect–action cards, territory (treasure) cards, and succession (point) cards are available to purchase. You start off only able to afford the cheap stuff, building your way up until you are finally able to back a princess. Now here’s where Heart of Crown starts to diverge from its Dominion parentage in an important way. 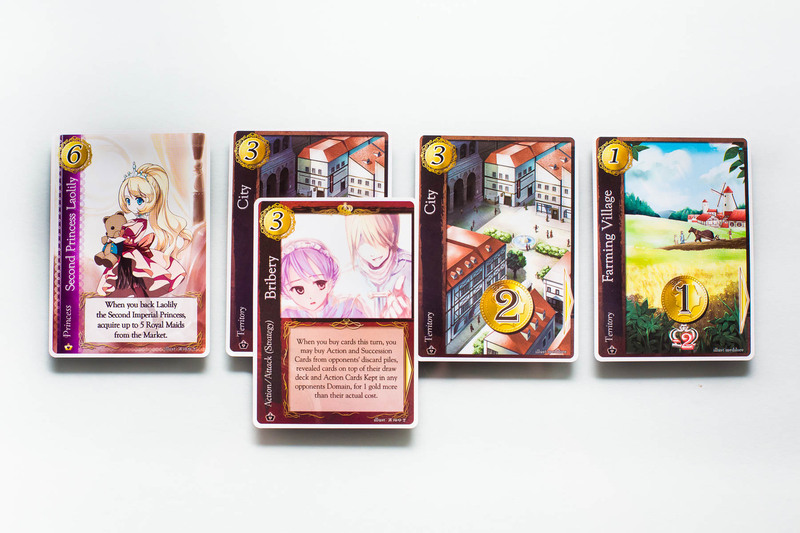 There are six princess cards (one is a set of twins), each with its own unique ability, to choose from. You must back a princess at some point in the game in order to begin playing (scoring) your succession cards, but the timing here is crucial. When you choose to back a princess, in addition to paying six gold, three territory (treasure) cards will be removed from your hand and placed in your domain in front of you. But if one of these territories is a starting card–a lowly Farming Village–that’s negative two points. And if it’s a Large City card that normally gets you 6 gold when played, you’re losing a lot of bank by not having that in your deck. But–and here’s the interesting part–each territory in your domain allows you to save an action card (of equal or lesser value) on it for a future turn. This means that instead of using a card now, when you don’t really need it, you can save it for when that big combo comes around. This is huge. Enormous. 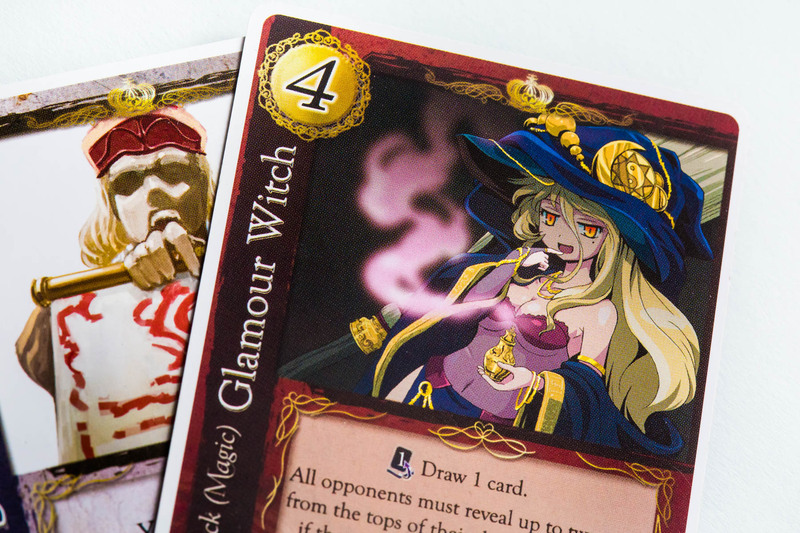 This eliminates the one thing I dislike most about deck-builders–the luck of the draw. You can save your Wishing Well until you have a dud hand and need a new draw. You can save your Bank card until you need a big payday. You can plan just the right moment to play a card, making it so much more satisfying because no one can say that it was luck that won you the game. Careful planning, unlike in most deck-builders, is a real thing in this game. 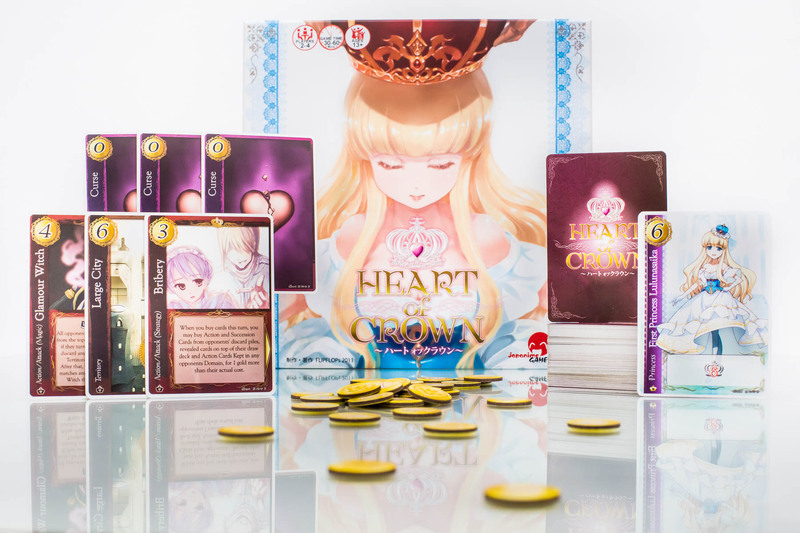 In Heart of Crown, as soon as someone takes that first princess, the race is on and you better grab yours soon before someone scores a fistful of Duke cards and leaves you in the dust. And unlike in Dominion, those points don’t clog up your deck. While it takes up a turn to play them to your domain, they don’t stay there constantly churning up like a nasty piece of gristle in your chicken soup. This just adds to the feeling that in Heart of Crown, you–not your deck–are in control. And that player control is what makes this game one of my new favorite deck-builders. So now I’m the one. I’m the over-excited friend pushing games on people like a back-alley puppy dealer. 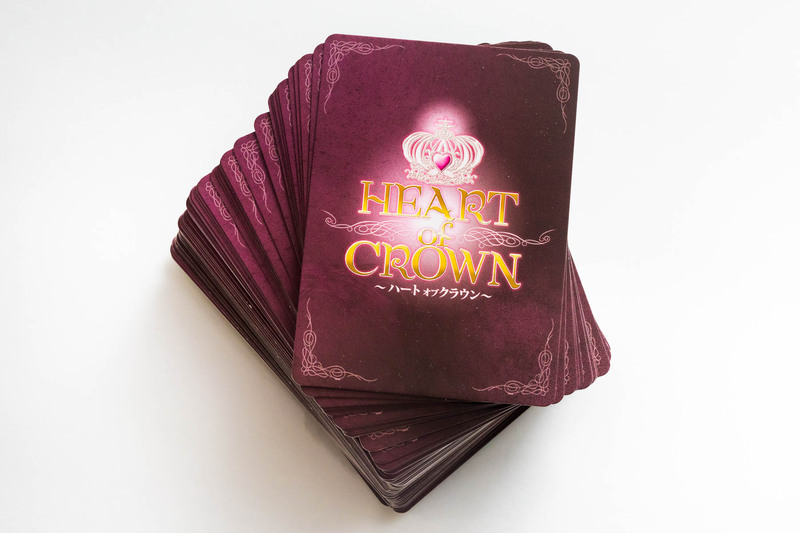 But now when I’m in the mood for a deck-builder as bait, it’s Heart of Crown, not Dominion, on my table luring in the unexpecting and getting them hooked and wanting more.